Metamorphic Rocks - Learning Journey! 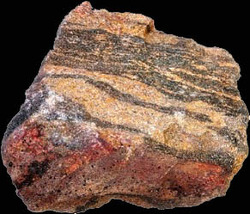 -Metamorphic rock is when a rock is changing from intense heat and pressure to form a new rock. Pressure and heat change alot of things, including rock! The rocks that change have a special name...Metamorphic Rock! are intense, which causes one type of rock to change/form into a new rock.Metamorphic Rocks begin to form at 12-15 kilometers beneath the Earth's surface. They begin changing from temperatures from around 100 to 800 degrees Celsius.If you squeeze and heat a rock for about a few million years they can then change into a new rock!The heat comes from Magma, while the pressure comes from layers of rock piled upon layers and layers of rock. The layers of rock on the bottom get squeezed, while the thicker the layers of rock there are the more pressure there is! Fun Facts: Did you know, Metamorphic comes from the Greek words meaning " Change" , and "Form". The oldest known rock lives here in Canada.The Acasta Gneiss, a Metamorphic Rock that is 3.96 billion years old!